Marc Boileau: 73-76, 151 GC, 66 W, 61 L, 24 T. 5-4 in the playoffs. Coached the WHA Nordiques for 2 seasons afterwards and led them to a championship. Died in 2000. Major points for having all of the vowels in his last name. He wasn't really one I readily considered to be in that next group, I'll be interested to hear the defense of him. EDIT: actually, it might be that he's the only coach above .500 eligible/remaining? Maybe I'll (or someone else) add him as an assistant coach later if I don't feel there's a player worth picking. Thanks. I know jack squat about coaches unless they are from 1990-present. So yea, I drafted based on W/L. Rylan wrote: Thanks. I know jack squat about coaches unless they are from 1990-present. So yea, I drafted based on W/L. 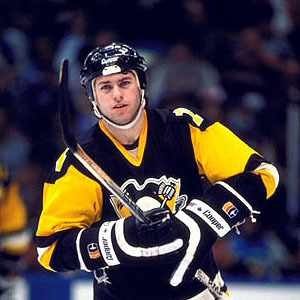 123 and 159 for 289 in 332 in 5 seasons with the Penguins. Sweet lid. Was also an excellent coach. He coached 13 seasons in North America and won 5 league championships. When do we vote? Just to let you all know, bribes are accepted. Please contact me via PM. Paypal available. There will be discussion and likely some voting towards the end once all the opinions/debates are out there. Yeah, not sure I'm getting my pick in within the 24 hour time limit. Not a problem, as far as I'm concerned. Get it in when you can. I'm still here. Just had a busy week and was on the mobile site the majority of the time. I could probably get picks in before midnight. Finally was able to relax and get on my laptop. Alright, to fill out my top 12, I'm going to take winger Wayne Bianchin. He had a great rookie campaign with 12-13-25 in 1973-74, but had his career knocked off course by a broken neck from a surfing accident. He was fully healed by the 1976-77 season, where he put up 28 goals and 34 points, and followed that up with another 20 goal season. The Pens lost him to the Oilers in the expansion draft. He could kill penalties, play the PP, and was described as a speedy, physical player who worked hard in the corners and played with an edge. And as for a 7th d-man, I'll take Chris Tamer (yes, I realize he's also a lefty. Pretty much all of the D left are left-handed). An extremely physical player who didn't play outside his means with the puck. I need some more physicality, and Tamer is a good guy to fill that. I'm going to pick Grant Jennings. Stay at home d-man with a physical element to his game. Two time cup champ. Good, strong bottom pair guy. Can we do that? Draft a head coach as an assistant coach.